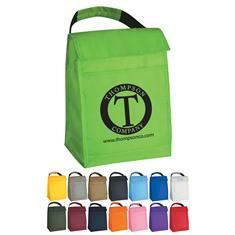 The insulated Budget Lunch Bag is made of sturdy 210 Denier Polyester and has a built in front pocket for extra storage. The color coordinated built in handle wrap is made for comfort and gives it a finished look. Available in 15 material colors for your selection. The top flap closure has a Velcro tab for security. Great for Teacher Appreciation, Health Promotions, School Spirit and Employee Motivation!